Bonsoir London produces and retails luxury nightwear and accessories. 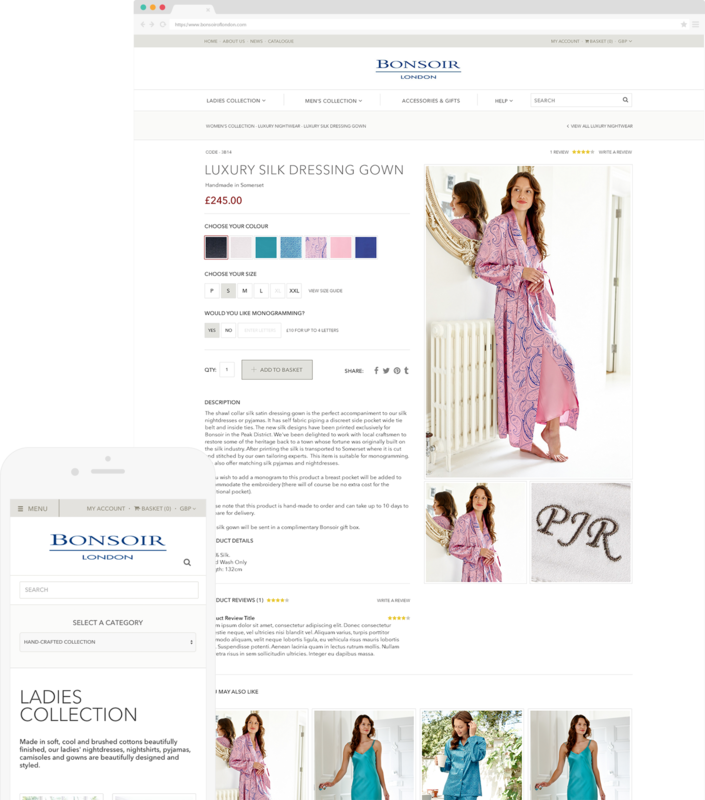 They engaged Evosite to create a new mobile-responsive on-line store that combined the best principles of effective eCommerce with the elegance, tradition, and attention to detail that characterize the brand. The project involved working closely with the client to understand the tastes and preferences of their customers. By developing buyer personas we were able to refine the design style and presentation that would be most appealing. Wireframes were developed for all devices to ensure that all site visitors would enjoy an effortless user experience. This leaves them free to focus on the quality and elegance of the products and makes online purchasing straightforward. The products are all about good taste, comfort and elegance and it was essential that the new site evoked the style, quality and traditions of the brand. This was, alongside the usual need for simple-to-use product selection, filtering and ordering. The smartphone user experience was carefully designed in its own right. You can view high quality images as large as your screen allows, and then scroll down to select size, colour and gift wrapping. The shopping basket shows clearly exactly what you’ve selected and a prominent CTA takes you to the checkout. There you have a wide range of secure payment options including one click ordering using SagePay. A professional team who delivered us with a new online presence which has delivered significant improvements in all aspects of the business and a seamless integration with our internal systems and software.